LIFAN's Pro Series Welder Generator AXQ200 is an industrial grade portable welder with a heat range from 60 to 200 Amp and capable of burning up to a 3/16 in. welding rod. Combined with a 4,000-Watt generator this is a very versatile piece of equipment with multiple uses for construction, farm or in the shop. This unit comes with a 15 HP, 420cc Industrial Grade engine, all copper wiring and windings, automatic voltage regulator, idle control, large capacity fuel tank, 1 in. fully welded frame, GFCI protected outlets and 30 Amp 120-Volt twist locks plugs. 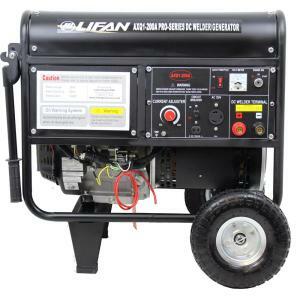 Tbook.com crawls the web to find the best prices and availability on Generators and related Tools and Hardware products like LIFAN Pro-Series GFCI 420cc Gasoline Powered Portable Generator with Welder Combo. For this page, related items include products we find that match the following keywords: "Generator GENERATOR" at our vendor partner Home Depot. LIFAN Pro-Series GFCI 420cc Gasoline Powered Portable Generator with Welder Combo is one of 152 Generators and related products listed in the Tools and Hardware section of Tbook.com If you have any questions on this product, please give us a call at 734-971-1210 during the hours of 9am - 5pm EST for assistance. Thank you for shopping at Tbook.com, the Internet Department Store!